Andrew Bynum was not with the 76ers Thursday, instead heading to New York City for a pair of joint-lubricant injections in his afflicted knees. A Sixers spokesman said the Synvisc injections were previously scheduled with Bynum's personal physician, Dr. David Altchek, and are not to be considered a setback. Bynum will take the rest of the week off and will resume his basketball-related activities next week, presumably as soon as Sunday. Bynum previously received Synvisc-One injections in September. It's understood that the lubricant can provide relief from pain for up to six months. 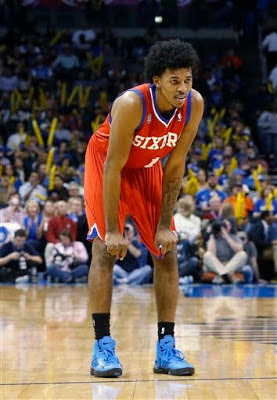 Monday, Sixers GM Tony DiLeo said it was possible that Bynum could participate in practice with the Sixers by Friday. That, clearly, is out of the question. In other news: Jason Richardson is in Vail, Colo., for an appointment with knee specialist Dr. Richard Steadman. Richardson is seeking a second opinion on his left knee. ... Damien Wilkins, who missed Wednesday's game, also was not with the team due to personal reasons. NICK YOUNG: "THE OPPORTUNITY IS HERE"
The 76ers have a good idea how to improve Nick Young's play. And, over the last few weeks, Young's been listening. The sixth-year guard out of USC continues to turn up his play, with Young chipping in 18 points, four rebounds and four assists in the Sixers' 92-84 win over Washington Wednesday. Beyond the stats, which have been eye-opening, Young has demonstrated an ability to alter his game – from trigger-happy shooter to all-around contributor. 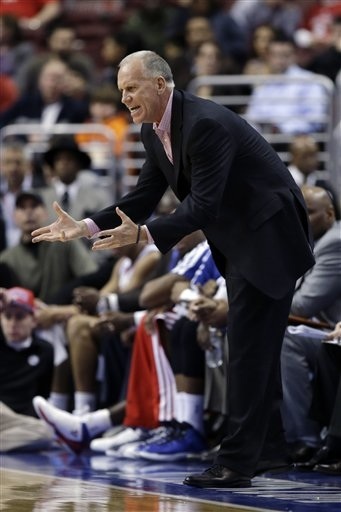 Maybe there's more to Young than that Swaggy P monikor, Sixers coach Doug Collins intimated. Looking for Andrew Bynum to ramp up his rehab? The guy ran the gamut Tuesday at practice. Strength work with a resistance band around his waist -- side steps, lunges, stepping forward, etc. Shooting. Lots and lots of shooting, from hook shots to power moves through the lane. Dunking. He finished his workout, at least that which was visible to reporters, with two dunks. Monday, Sixers GM Tony DiLeo said it's conceivable that Bynum could join the Sixers in practice by the end of this week. 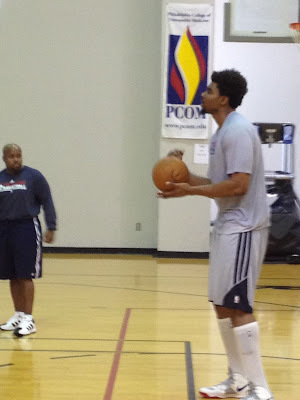 Bynum certainly looked as active as ever in Tuesday's workout. ANDREW BYNUM: "I DUNKED (SUNDAY). HAPPY TO KNOW I COULD STILL DO THAT"
Still targeting the All-Star break for debut? Practice by the end of the week? Do you feel like, in your rehab, you could practice at the end of the week? Are you where you thought you'd be at this point? Any consideration to playing before the All-Star break, then using the week between to see how you feel? ARE SIXERS CONSIDERING A MAX DEAL FOR INJURED CENTER ANDREW BYNUM? Saturday, Jrue Holiday had a Jrue Holiday-type game, which meant everyone was talking about Jrue Holiday. Understandably, right? Whoa. Hold the phone here. Curry said what? 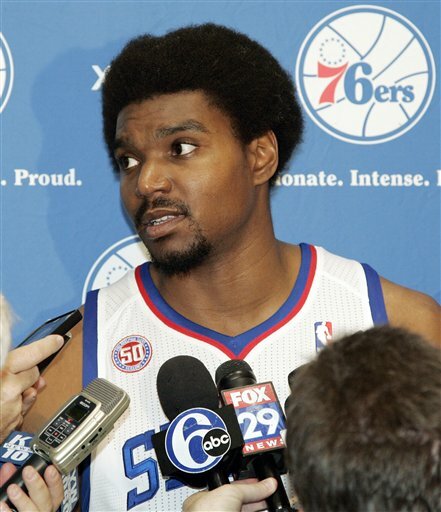 To date, no one from within the Sixers' organization has said anything about Bynum long-term. Every question has been answered in the same guarded way, that they're waiting and hoping, praying and finger-crossing, that Bynum returns to the court and debuts for the Sixers sooner than later. That someone mentioned Bynum in the same breath as the term “long time” is kind of a revelation. What does it mean? Nothing much. It's a postgame quote lauding the play of one star with the mention of another. 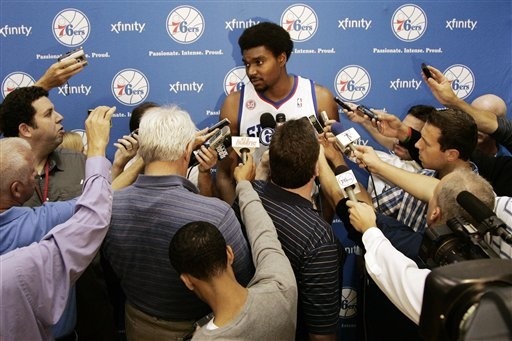 Does it mean the Sixers have had internal discussions about Bynum returning? You could have made those assumptions long before those words left Curry's lips. But it's certainly news – or, at the very least, new – that someone views Bynum in that light. The last two days at practice, Spencer Hawes ran with the first team. Last year, that wasn't uncommon, with Hawes being a starter for the Sixers. Saturday, against visiting New York, Hawes earned his first start of the season – and it was deserved. Nick Young also gets the nod, in place of injured Jason Richardson. In his last 10 games, Hawes had averaged 11.8 points on 51.5-percent shooting, with 6.9 rebounds, 2.4 assists and 1.4 blocked shots in 28 minutes. Compare those numbers against those of starting center Lavoy Allen, who had amassed 6.3 points on 48.4-percent shooting, with 5.1 rebounds, 0.7 assists and 0.9 blocks in 21 minutes per game. They're not too far apart, but they're not identical either. Hawes is giving the Sixers more in his minutes than Allen has, which justified the move. Perhaps in a big to downplay his performance of late, Hawes said it's because his teammates are so familiar with what he does best. Sixers coach Doug Collins intimated earlier this week that adding Hawes to the starting five wasn't the most-sound idea, because that would leave the cupboard bare in terms of scoring options he could bring off the bench. Moments before Jrue Holiday talked to reporters Thursday about making the All-Star Game, Andrew Bynum – the guy everyone expected to put up All-Star numbers – Velcro'd his way into a right knee brace in order to launch his shooting workout. Holiday was all smiles as he addressed the topic, of earning an all-star nod for the first time in his career. And, between questions about his trip next month to Houston, Holiday was asked about how different his season would've gone had Bynum been able to run alongside him. But would Sixers coach Doug Collins have been less likely to have put the keys to the Sixers' car, so to speak, in your hands? Maybe it would've been more of a shared role between the two? When Bynum eventually returns (and the injured center said he hopes it's sometime either before or after Holiday's trip to Houston), Holiday said he doesn't anticipate any sort of lag on the court. Even though the Sixers haven't had too many opportunities to work out with Bynum, who does most of his shooting on the side after practice, Holiday said the chemistry between he and Bynum is strong. 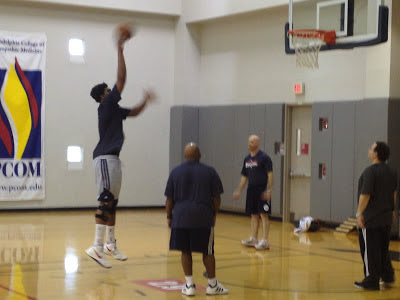 As for Bynum's workout Friday, he didn't look at all hindered by the right knee brace. He told me that it's more for additional support than anything else. Bynum worked on a couple moves, namely taking passes in the chest from 10 feet away and working on one-dribble, turnaround shots in the paint. He tried his hand at bank shots from about the same distance. His touch looked solid. Jrue Holiday is an All-Star. The Sixers point guard was selected Thursday by a vote of Eastern Conference coaches to be a reserve for the NBA’s All-Star Game, to be played Feb. 17 in Houston. It’s Holiday’s first selection, though he played in the Rookie Challenge in 2011 as a second-year guy the same weekend as the All-Star Game. It’s also the second straight year the Sixers will have a representative in the All-Star Game, with Andre Iguodala making it a year ago. A fourth-year guard, Holiday is averaging 19.0 points and 9.0 assists for the Sixers. Validating Holiday’s status as an All-Star pick: He’s the only player in the league averaging at least 19/9, and the Sixers (17-25) were winless in the four games he missed in December with a left foot injury. This week, Holiday said he didn’t want to get too amped up for the possibility of getting chosen. The rest of the East reserves are: Chicago's Luol Deng and Joakim Noah, Cleveland's Kyrie Irving, Miami's Chris Bosh, Indiana's Paul George and New York's Tyson Chandler. MILWAUKEE – Tuesday night, like a pot that's been on the stove too long, Doug Collins boiled over. He vented his frustration, letting it all out in the moments following a 110-102 loss to the Bucks. He didn't hold anything back, either. The Sixers coach voiced his discontent with his team's penchant for starting slowly, argued that a lineup change would do his team no good, danced around calling his players individualistic and suggested that they'd be the same even if he wasn't the coach. Yep, it got to that. My hope is that the Sixers' play -- which has resulted in 16 losses in 21 games -- won't cost Collins his job. There are far too many variables at play here. For one, Andrew Bynum has yet to play and the team was designed around him, you know, playing. Second, they lost four straight without Jrue Holiday, during that four-game stretch he sat with a foot injury. Third, they had an eight-game roadtrip around the holidays, one no other team in the league embarked upon. I'm not trying to make excuses, so pardon me if it sounds that way. I'm merely attempting to point out that the Sixers' performance isn't an indictment only on the coach. It's also circumstantial. THAD YOUNG SAYS SIXERS ARE IMPROVING AS THEY'RE "TRYING TO FOCUS IN"
MILWAUKEE --- Remember when the Sixers were four games over .500? Remember when they were thought to be a challenger in the Atlantic Division, even without Andrew Bynum? 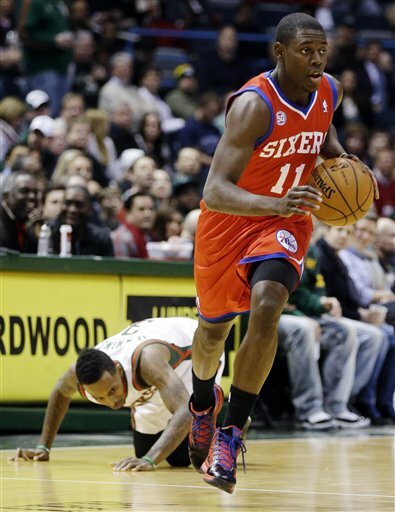 The Sixers (17-24), who are at the Bradley Center tonight against the host Bucks, are at the midpoint of their season. Since they opened with a 10-6 mark, they've lost 18 of 25 and have slid into fourth place in their division ... and ninth in the Eastern Conference, on the outside looking in at the playoffs. The hope of Bynum's return isn't enough to keep the Sixers afloat, though. 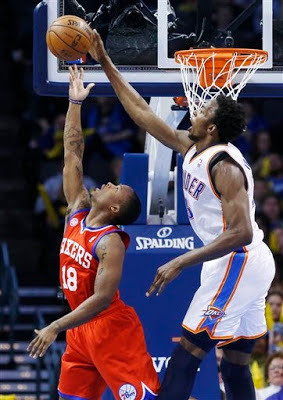 As Thad Young (pictured) put it yesterday, the Sixers failed to step up "when we needed to play big." That's what it's going to take in order to string together wins ... and assemble their first winning streak in nearly two months. “These last two games (Jan. 18 vs. Toronto, Monday vs. San Antonio), it definitely showed that we're going out there paying attention, trying to make runs, and we're trying to focus in," Young said. "The effort was there. The focus was there. The concentration was there. Everyone's playing on the same page and at a high level. It's just about finishing games." Fortunately for the Sixers, they get a chance tonight against the Bucks. And all they had to wait was 24 hours for a fresh slate. ANDREW BYNUM: "I'M NOT FEELING ANY PAIN. IT'S ALL GOOD. I WANT TO KEEP GOING." 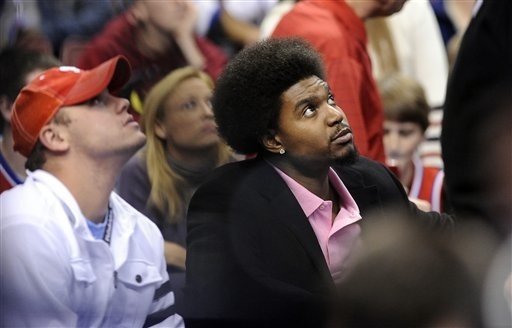 Andrew Bynum updated his status Monday, before the Sixers hosted the San Antonio Spurs. The big man said he's feeling better, he's pain-free and he'd like to step up his rehab, but doesn't want to do anything stupid. Still hoping for a return at the All-Star break? Have you done any starting or stopping? Dr. Jack McPhilemy, Sixers team doctor, was at practice Sunday. What'd he say? What can you show this team or other teams about what you are? Lateral is next – when? What step is next on the six-step plan? IS JRUE HOLIDAY AN ALL-STAR? Eastern Conference coaches have until noon Wednesday to cast their votes, determining whether 76ers point guard Jrue Holiday is deserving of his first all-star bid. The number is his favor are that the Sixers were 0-4 without him in December, when he missed time with a left foot injury, and 17-19 with him -- right around where they expected to be. He's also the only player in the league averaging at least 19 points and 9 assists. Not even stud point guards like Rajon Rondo, Chris Paul, Greivis Vasquez, Russell Westbrook or Deron Williams can say that. What goes against Holiday, though, is the Sixers' record. It's something Sixers coach Doug Collins said he looks at when deciding who should represent a conference among the all-star reserves. So what do you think? Leave your thoughts in the comments section, email me (cvito@delcotimes.com) or Tweet them to me (@ChrisVito) to start a dialogue. 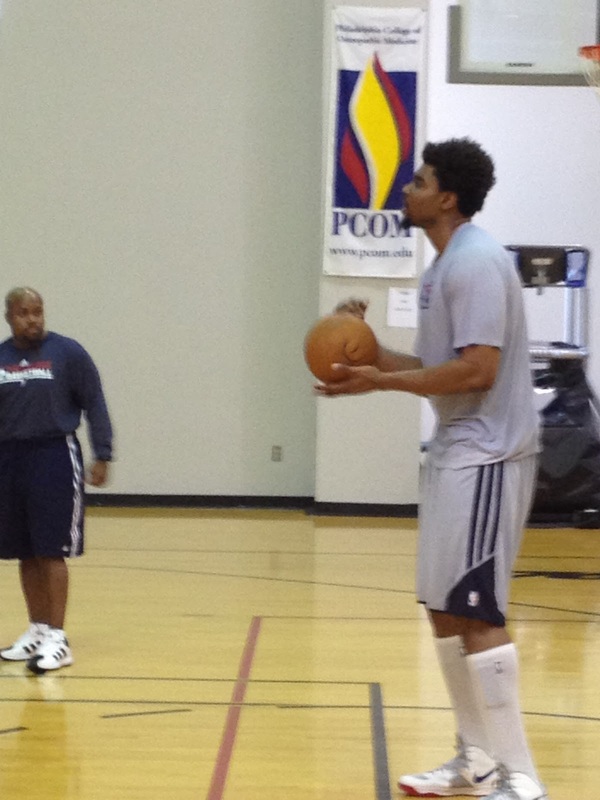 Andrew Bynum's knees must be feeling better, because he upped his rehab some more. Thursday, after the Sixers' practice had concluded, Bynum began taking shots. This time, he was jogging lightly to certain spots on the floor, at the high post, and receiving bounce passes before tossing up a few hooks and jumpers. 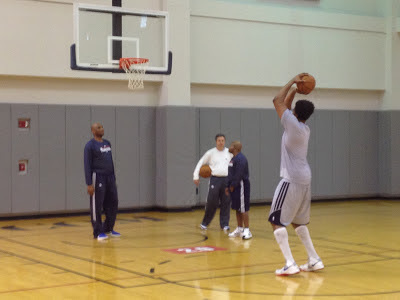 Earlier in the week, Bynum was only shooting from a stationary position. “It's a huge lift," Sixers coach Doug Collins said. "The thing I like is Andrew is a very hard worker. When he came here, he knew nothing about our organization – other than we wanted him and he grew up in New Jersey and we wanted to make him a focal point of what we were doing. He came in here with his own medical people. Now he's working with our people and ... that's a positive sign. "I worked out on the elliptical (Wednesday) while he was working out and he was working his tail off." 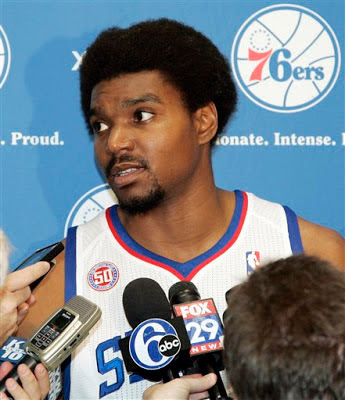 Think Collins hasn't considered what it'll be like when Bynum debuts for the Sixers? “He sees where we are right now and … you think he's not sitting there thinking we might have seven or eight more wins?" Collins said. "It's interesting. I was looking the other day. Pat Riley lost Dwyane Wade one year and went 15-67. The Spurs lost David Robinson and went from a 60-win team to 17-47 when Pop (Gregg Popovich) took over the team. That's the impact star players have on the game." SIXERS: WHERE TO FROM HERE? 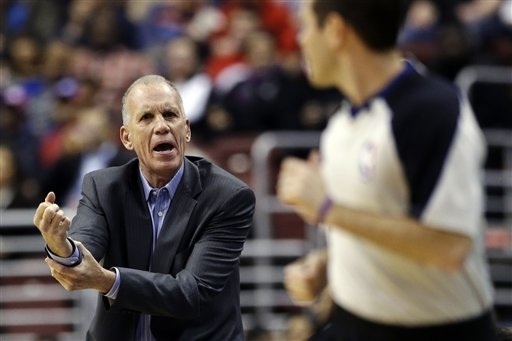 A reporter questioned whether Doug Collins has lost his team. Collins refuted it convincingly. The Sixers were outscored, outshot, outrebounded … and the list goes on. If there's something that could've gone wrong for the Sixers, it did in their 111-99 loss to New Orleans. So where to from here? What's next for the Sixers, who came within an eight-point deficit in the fourth quarter of winning consecutive games for the first time in six weeks? 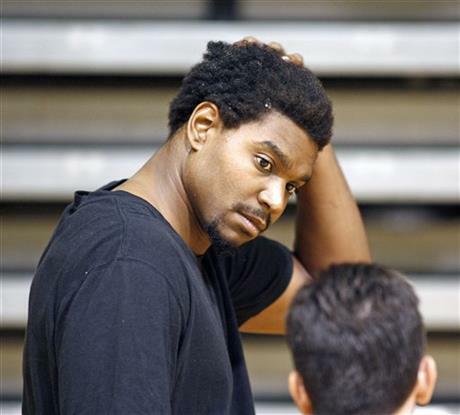 Hold out for Andrew Bynum, who said Monday he thinks he can be back by February? Hope that the struggling defense finds its way? Hope Nick Young scores 14 points in 12 fourth-quarter minutes every night? “Had to try to do something,” Collins said. “What do they say is the definition of insanity – doing the same thing over and over again and expecting different results? So I didn't want you to call me insane after the game. The only thing consistent about the Sixers is Jrue Holiday, whose 29-point, 11-assist performance was a thing of beauty. Thad Young wasn't half-bad, either, coupling 12 points and six boards. But by and large, the Sixers didn't get anything from anyone else. Spencer Hawes and Lavoy Allen were ghosts on the board. Royal Ivey and Damien Wilkins, believed to be saviors to the Sixers' defense, were porous at that end of the floor. Jason Richardson couldn't buy a bucket. And Evan Turner … where's he been lately? Collins doesn't know what he's going to get any time out. It's not that he's lost his team. It's that he doesn't know how to get enough from his team to make it a winning ballclub. Everybody else had left the court at PCOM, when Andrew Bynum grabbed a ball and – with assistant coach Michael Curry serving as his rebounder – began to take shooting practice. It's not the first time Bynum says he's taken shots, but it's the first time in front of reporters. Bynum, who has missed the entire season with bilateral bone bruises in both knees, said Monday he's hoping for a return to the court after the All-Star break. Mentally, does it feel good to be on the court? Did you approach Michael Curry about helping with the workout? “Not on the court, but on the treadmill over there. It's starting out with a jog and then running. I haven't sprinted and stopped. Aceleration and deceleration and stuff like that, I'm still working up to that. Where are you with pain? But is it tolerable to work through it? How good are these signs for you? What do you do when you're done – ice? Do you feel a weight off your shoulders? Any indication about the next stage of rehab? What's the next basketball stage? So you'll do stationary shooting for the next week? Do you have a date circled on your calendar for a return? Probably after the All-Star break? How did it feel to step back out there? Saturday night, the Sixers gave up 100 points. More importantly, they scored 107. And out the door went their five-game slide. They didn't have Swag, but that didn't matter. Afterward, the Sixers could have patted themselves on the back for a job well done – having snapped a losing streak, having reached triple digits on the scoreboard, having broken out of a stretch in which the opponent beat them embarrassingly by 18 or more points. Instead, the Sixers spoke glowingly of their defense. And justifiably so. 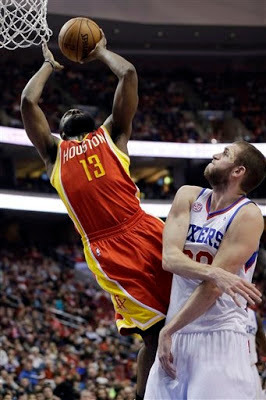 The Sixers – despite James Harden's 10-for-19 shooting display – clamped down on Houston's hot-handed guard in the biggest situations. Sixers coach Doug Collins tried just about everybody on Harden, from Jrue Holiday and Evan Turner to Jason Richardson and deep sub Damien Wilkins. Giving Wilkins 11 minutes meant taking time from elsewhere – like sitting otherwise-healthy guard Nick Young. The guy they call Swaggy P was absent in a high-scoring affair. Seems unjust, right? Not for a team that needed a win desperately. “We've got to get some defensive identity,” Collins said. Whatever it takes to right the ship, right? The 76ers lost Tuesday to Brooklyn. They were outscored at the foul line by 13 points. You could argue that the free-throw discrepancy led to the Sixers' 20-point loss. And some in the organization took that route. Others didn't. “I've never seen anything like it. I just haven't,” said Sixers coach Doug Collins, whose team went 6-for-10 at the line, compared to Brooklyn's 19-for-22 effort. The Sixers' Evan Turner wasn't as diplomatic. “We go to paint. There's no reason to keep talking about it. We go to paint,” Turner said. “There's no point in talking about it. When you go down and there's one foul and another foul that's not called. We go into the paint just as much as other teams. It's not new. For the past three years, we haven't really gotten calls. That's not on us anymore. The Sixers (15-21) rank 28th in the NBA in free-throws made and free-throws attempted. So don't just take the Sixers at their word. Judge for yourselves. The Sixers recalled Arnett Moultrie from the NBA's D-League Sunday, and the future of another rookie -- Maalik Wayns -- is in jeopardy. The team announced it had waived Wayns, an undrafted guard out of Villanova. 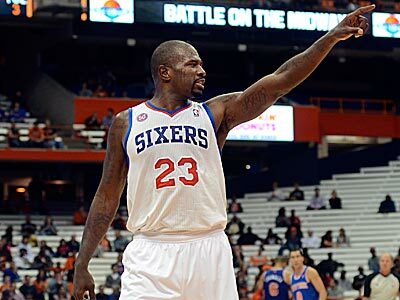 Wayns, who averaged 2.5 points in 20 games, had played only two of the Sixers' last seven. 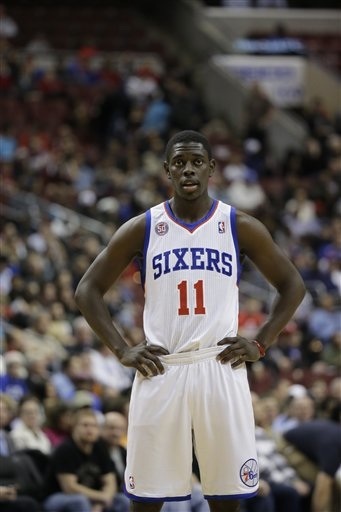 Coach Doug Collins once had envisioned Wayns as a backup point guard to Jrue Holiday, but that plan never materialized. By rule, Wayns will remain on waivers for 48 hours. If he's unclaimed, the Sixers can sign him to a more-temporary contract than what they would have been locked in to with Wayns' rookie deal, which carried a partial guarantee had they not made a move prior to today at 5 p.m.
Moultrie, assigned to Sioux Falls Dec. 21, hadn't been getting minutes with the Sixers. In his time in the D-League, the first-year forward out of Mississippi State averaged 9.7 points and 6.1 rebounds in seven games. The Sixers need more from Moultrie than six minutes per game over 11 appearances. OKLAHOMA CITY – In one facial expression, Evan Turner summed up the 76ers' night. He raced up-court to play defense, clutching the wrist on his right hand with the thumb and index finger of his left, signaling to an official that he expected a call that he didn't get. These days, the Sixers aren't getting too many calls. And coach Doug Collins doesn't blame the officials for that. In a 109-85 thumping handed out by Oklahoma City, the Sixers attempted eight free throws Friday. All eight were taken by Nick Young. No one else. Collins was asked afterward if he informed his team of the foul shot disparity. The Sixers are not a physically tough team. They're a team that's content to rely on jumpshots. That's partly opinion, partly rooted in fact. Consider these numbers: The Sixers rank 28th in free-throw attempts (600) and 28th in free-throw makes (436). And because they rank 26th in free-throw percentage (.726), they're not even making the shots they're earning. 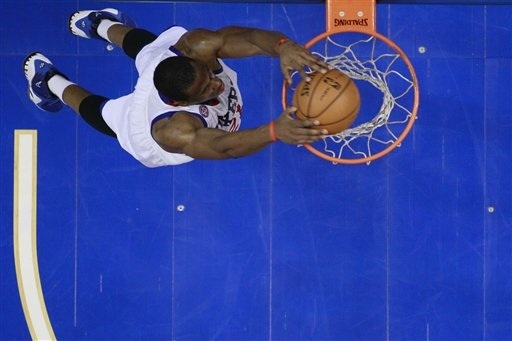 “In certain situations, we rely on pull-ups and getting cleaner shots,” Turner said. “That's not the first day where people are like, 'We don't get foul calls.' That's what happens. I'm not about to waste my time relying on someone else giving me a call. One could argue that Jrue Holiday, the Sixers' primary ballhandler, could jump-start the foul-shooting spree by driving. After all, Holiday ranks 63rd in the league in attempts from the line. But because Holiday is at his best driving and kicking for a team loaded with 3-point threats, the task of drawing contact and, subsequently, fouls has to fall on someone else. Maybe that someone else is Spencer Hawes, a big with only 62 free-throw attempts. Maybe that someone else is Lavoy Allen, another big who is severely underperforming when it comes to drawing fouls (34 FTA). There have been plenty of those nights for the Sixers. For their sake, and for the sake of finishing an eight-game roadtrip with a win Saturday at San Antonio, maybe they should drive the lane instead of shooting jumpers. OKLAHOMA CITY – A hotel flood aside, the Sixers spent the bulk of their Friday morning in good spirits. Nonetheless, the Sixers seemed happy Friday – an emotion they haven't experienced too much of on this season-long, eight-game roadtrip, on which they've lost four of six thus far. Could they have walked out of Phoenix with a win? Sure. Same goes for a tight game in Portland. It doesn't sound like Jason Richardson's all that worried about it, though. Richardson said the time away from Philly has led to significant bonding time, like hotel-room hangouts, dinners among teammates, and a New Year's celebration in Los Angeles with the players' wives and girlfriends. So even if two more wins don't come of the roadtrip – and they might not, considering the Sixers face division-leading OKC and San Antonio – the team can bring camaraderie home with it.